The attack tunnels dug by the Hamas from Gaza into Israel are great for the public relations of terrorists. They make for a deeply unsettling image that intensifies the threat perception among Israelis. Terrorists want to be feared and the tunnels seem to achieve that goal, despite their limited destructive potential. In January 2016, IDF Chief of Staff Lt. Gen. Gadi Eisenkot played into the hands of the Hamas terrorists by saying that countering the tunnel threat was the army's "number one mission this year." Eisenkot's statement showed that he prioritized the tunnel threat over Hezbollah's growing rocket capability to Israel's north or the threat from IS in the Sinai. Moreover, he belittled the serious nuclear threat from Iran. Similarly, Education Minister Naftali Bennett gave in to the popular mood and exaggerated the threat of the Hamas tunnels. He accused Prime Minister Binyamin Netanyahu of leaving the cabinet in the dark about the grave danger of the tunnels until after Operation Protective Edge had begun. 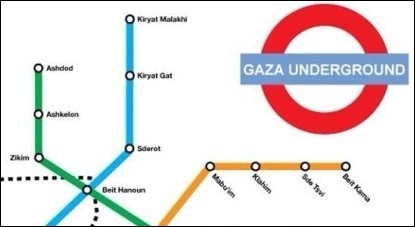 The threat to Israel of terror attack tunnels from Gaza is exaggerated. A leaked draft of a report by the State Comptroller also criticized Netanyahu, then-Defense Minister Moshe (Bogie) Yaalon and then-IDF CoS Lt. Gen. Benny Gantz for failing to anticipate the Hamas tunnel threat. In any case, in the summer of 2014, Israel went on a ground attack to destroy tunnels that crossed into Israeli territory. Heavy fighting ensued, particularly in Shujaiyeh, a neighborhood of Gaza City. Forty-one Israeli soldiers were killed and many more injured during the ground phase, which ended after 32 tunnels were destroyed. Following the development of the Iron Dome system, which has largely neutralized the rocket threat from Gaza, tunnels became an important tool in the Hamas arsenal. They are a low-tech challenge and quite difficult to handle. So far, Israeli efforts to develop technologies to locate tunnels have achieved only partial success. Yet the tunnels' potential ability to cause significant damage to Israel is itself limited. True, they enable terrorist attacks and/or the hijacking of dead or alive Israelis. While Israeli inhabitants around Gaza are most directly affected and obviously the most concerned, this type of threat, while undoubtedly disturbing, is not new. Acts of terrorism have always been considered by the national security establishment as secondary to dangers that affect Israel's territorial integrity or threaten its very existence. The tunnels cannot threaten strategic targets within Israel, such as power stations or airports, as Hamas missiles have done in the past. Investing in defense against missiles is important; spending money to negate the effects of tunnels is much less so. Limited resources dictate that spending be prioritized in accordance with the relative magnitude of the threats to be faced. Plans to build a very expensive subterranean wall around Gaza make no strategic sense. Nevertheless, the defense establishment, prodded by Defense Minister Avigdor Lieberman, is planning a giant project – a 60-kilometer wall around the Gaza Strip that will reach a depth of dozens of meters. Initially, a trial section will be erected at a cost of 600 million shekels ($158 million). This "Maginot Line" around Gaza, if completed, could become one of the most expensive projects in Israel's history. The high priority allocated by Israel to the problem of the tunnels is totally unjustified. First, it is not clear that the planned Gaza Wall would be effective in preventing Hamas underground projects. Concrete walls can be penetrated, as bank robbers have shown. Israel should not underestimate the ingenuity of the engineers employed by Hamas. Second, this ambitious project diverts resources from financing more important needs of the IDF. One very pertinent example is the neglect of ground forces due to financial considerations. Beefing up ground forces is an imperative in dealing with the looming threats of accurate missiles and a number of other serious contingencies. The mammoth wall project is a public relations gift for Hamas. Third, the tremendous effort to handle the tunnel threat unnecessarily magnifies the power of the enemy to harm Israel. The mammoth wall project is a public relations gift for Hamas. Moreover, its timing is problematic, as there are signs that Hamas is getting tired. The rounds of violence have taken their toll on Gaza. It looks as though Israel's "mowing the grass" strategy, and the growing regional isolation of Hamas, may have created a modicum of deterrence. Hamas seems reluctant to initiate hostilities. The project to build a wall around Gaza appears to be motivated by domestic politics. It is intended to calm the understandable concerns of the inhabitants of the southern region with regard to the tunnel threat. It enables the government to relieve the constant political pressure by stating that it is "doing everything possible" to find a solution. It is, however, a wasteful populist response. Above all, it makes no strategic sense.